We know that you're under the impression that mermaids are nonexistent but you couldn't be more wrong, friend. Mermaids are the world's best kept secret. The half-men and half-fish race is alive and thriving and it's all because of a secret underwater gang of finned brutes: the Mermaid Mafia. However, we've heard old fisherman tales of people successfully bribing the underwater cosa nostra to escape their wrath. It turns out the Mermaid Mafia loves decorating themselves with sparkly bling bling, especially gold (it matches their tridents.) We know it's not practical to carry a fist full of golden trinkets while you're out at sea, which is why we're going to let you in on another secret tactic to avoid a mermaid assault: this very costume. If you can't beat the mermaids (which you definitely can't) then join them (or at least pretend to), by wearing a men's Mermaid Mafia costume. The scaly pants feature a strategically placed seashell, the muscle tank turns you into a rowdy-looking Poseidon doppelganger, and the curly white beard completes your transformation into a sage sea siren. 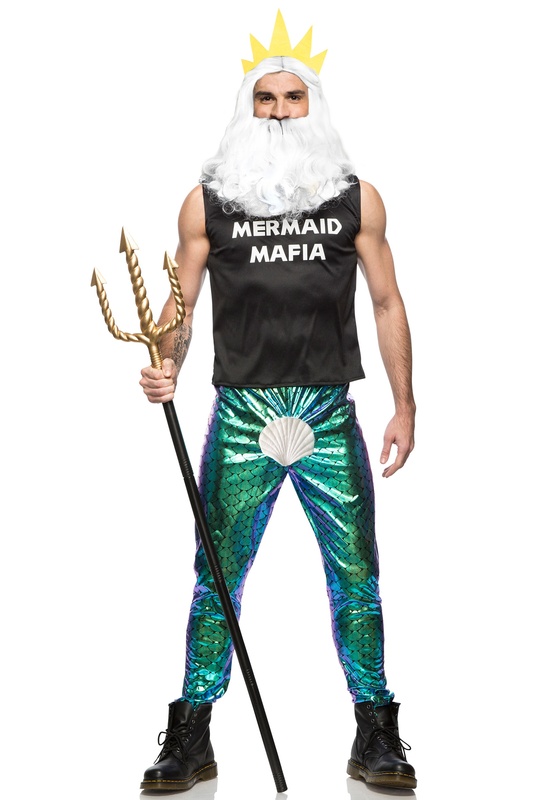 Wear this costume the next time you're coastal to make sure you don't become the newest casualty of the Mermaid Mafia!